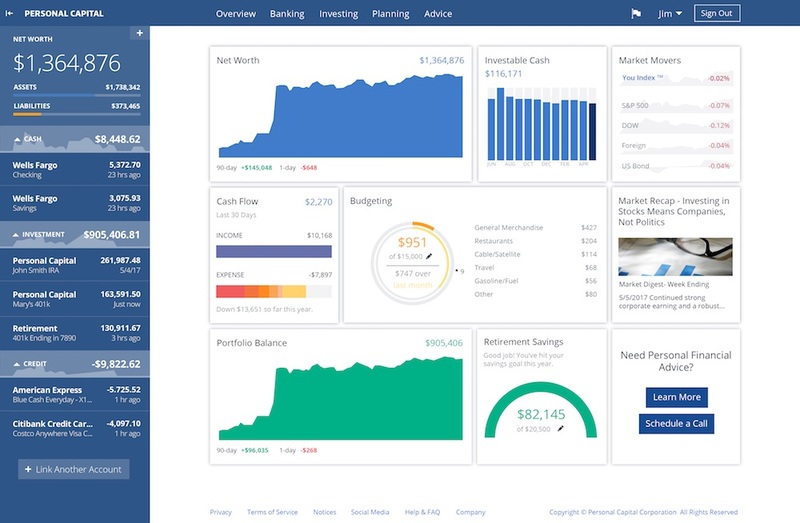 Since I’m a professional software developer and also the Mad Fientist, I love good financial software and I’m always excited to try a new application when I find one. For years, I’ve used Mint.com to track and categorize my spending. Since Mint is primarily a budgeting tool, it works great for those purposes but it isn’t as great for portfolio management. Personal Capital is a free online tool that allows you to keep track of all of your investment accounts in one place. It is very similar to Mint, in that it accesses and pulls data from all of your accounts automatically, but it is far superior in terms of how it presents your portfolio data. The first thing you need to do after setting up your free account is link all of your savings/investment accounts. If you are already a Mint user, you know how this works. I actually found that it was much easier to set everything up in Personal Capital than it was in Mint so that was a nice surprise. After you get everything set up, you’ll notice that Personal Capital presents you with a very attractive snapshot of your financial situation (note: these screenshots aren’t of my own accounts so don’t berate me for the ridiculous spending figures in the pictures!). The main piece of information that is immediately presented is your net worth. For those of us on the path to financial independence, it’s very motivating watching this value rise so I like that it is the first thing you see when you log in. 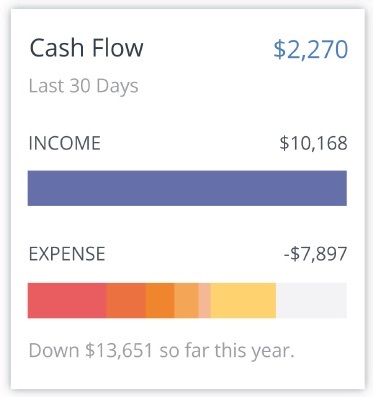 The second section on the main screen focuses on cash flow. This section allows you to quickly see your savings vs. spending rates which, as we all know, is a key component to how quickly you can achieve FI. Another section on the initial page provides a snapshot of how your portfolio performance compares to the performance of the major market indices. On the Allocation page, you can see a very nice representation of your portfolio allocation. 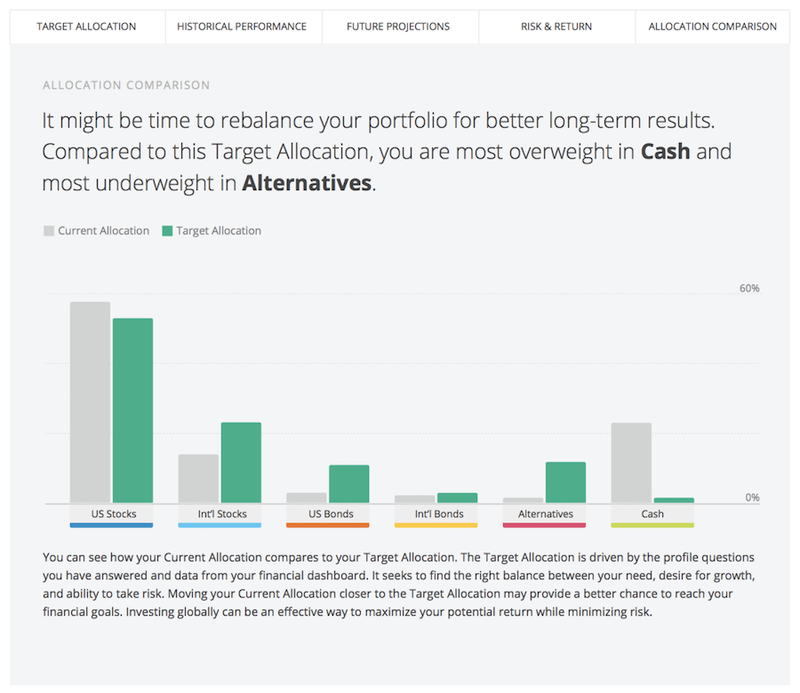 On a separate screen, you can even set up your ideal allocation and then the software will highlight how much your portfolio deviates from your ideal allocation. 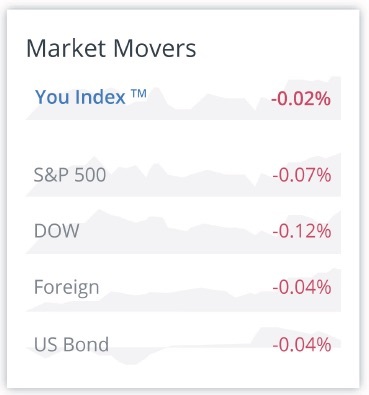 The software also allows you to drill down and see exactly how your portfolio is weighted within the various asset classes. For example, if I click on the U.S. Stocks section, I am then taken to a graph showing me how much of my portfolio is invested in large cap growth stocks, small cap value stocks, etc. For someone who holds mainly broad-based index funds, it’s nice to peek inside the funds to see how my portfolio is weighted. Another excellent feature of the application is that it highlights exactly how much you are paying in fees every year. You can see in the screenshot above, it clearly presents the expense ratio and total fees per year for each of your investments. 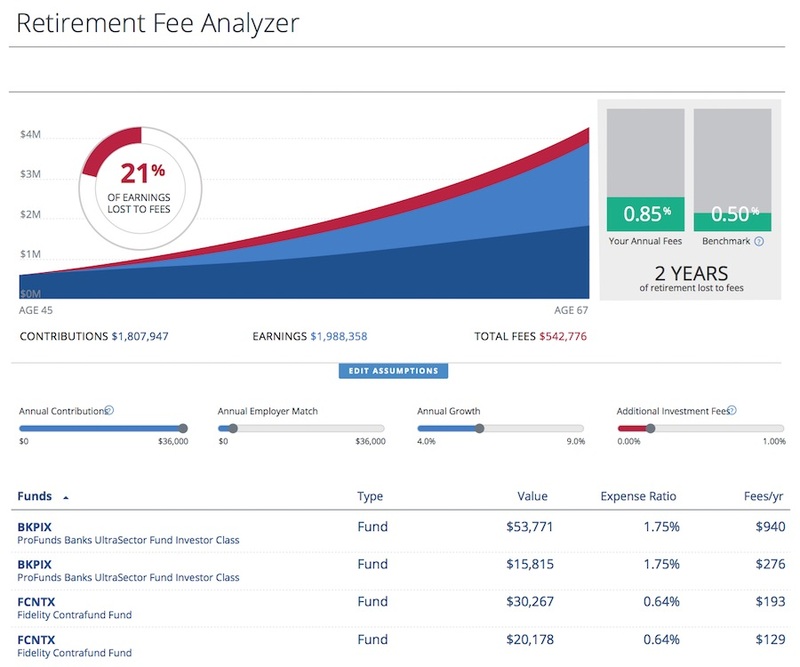 The software also projects those costs out to show you how much of your portfolio will be lost to fees by the time you reach retirement age. 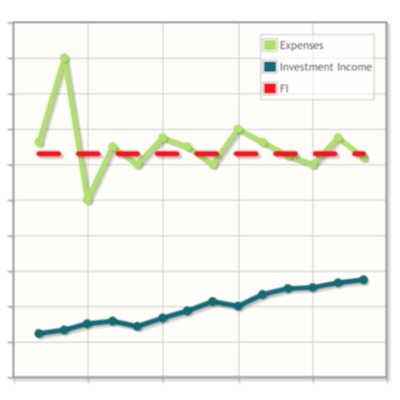 In the example screenshot above, an expense ratio of 0.85% will result in 21% of the person’s earnings, or over two years of retirement, being lost to fees! If only investment expenses were presented this way everywhere, people would be more diligent about minimizing their investment fees. In addition to the beautiful web interface, there are also nicely designed iPhone, iPad, and Android applications available that are free to download and use. So you may be wondering, like I was, how they could offer all of this amazing functionality for free. Well, it turns out they make their money as financial advisors. You’ll notice on some of the screens there are buttons to speak to an advisor so presumably, it’s possible to sign up for an advisor and pay a fee to get help with managing your portfolio. I prefer to do my own research and manage my own investments, so I won’t be taking advantage of this service, but thankfully all of the tools I described above remain free to use anyway. I’ve really enjoyed playing around with Personal Capital and I can see myself using it more than Mint in the future. It gives me most of the information I’m interested in and it displays it in an attractive way. While Personal Capital is the clear winner overall, Mint.com does offer superior budgeting functionality so I’ll continue to use Mint to track and categorize my spending. What do you think? Have you used Personal Capital before? If so, are you as impressed by it as I am? If you haven’t used it yet and are interested in checking it out, sign up for a free account here and let me know what you think! 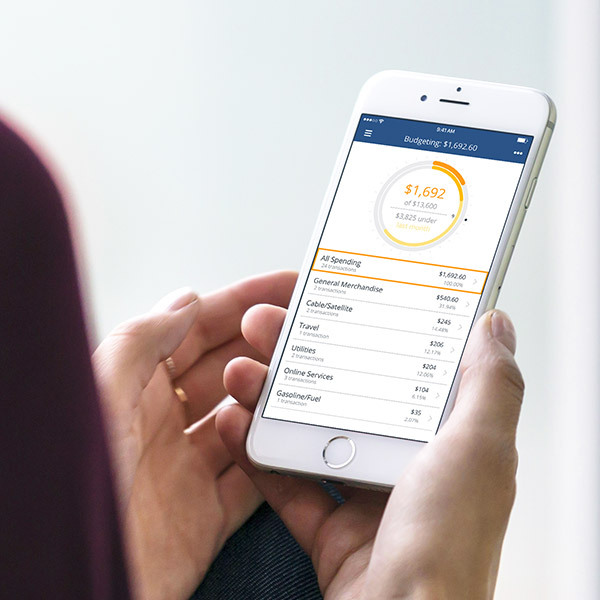 Track your progress to financial independence and early retirement with the new FI Laboratory application! Nice, the views look nice and I have a question (possibly a future post). How active do you have to be in managing your finances? I’ve tried and left Mint because the automatic grabbing of the data doesn’t let me understand it as well as I’d like. The same for investing, I need to look at and think through what the choices are rather than selecting a target date fund and being done with it. If there’s a question, it’s this, what have you chosen to automate and what haven’t you and what’s moved between the two? I’d actually say the less active, the better. The more you screw around with your investments, the more opportunities you give your dumb brain (see Cognitive Bias) to get in the way. I actually don’t do anything with my portfolio right now, except figure out where to allocate new money. I’m planning on getting slightly more active, in that I want to review my investments quarterly to rebalance and to harvest any losses for tax purposes (which I will be writing more about in an upcoming post). Personal Capital is perfect for planning my rebalances and tax-loss harvesting so that’s why I was so excited to find it (since I too felt that Mint did not provide an adequate picture of my portfolio). As far as what I have automated, most of my investment contributions are automated, since I still have an awful habit of trying to time the market. The only non-automated contributions I have are those for my taxable account (which is for tax-loss-harvesting reasons). As I mentioned, I don’t do much else with my investments so there’s really not a lot going on! I just reread my comment and I want to make sure you don’t think I was saying your brain is dumb! I only meant that our brains sometimes covertly sabotage our investment plans so it’s best to take them out of the equation as much as possible. The way I phrased it though made it seem like some sort of personal attack, which it definitely wasn’t! Rule #1 of blogging: Don’t tell your readers and fellow bloggers that they have dumb brains. No offense taken and I didn’t read it as that. Yes, my brain (everyones right?) makes poor choices and timing the market is certainly one. My general thought – which I didn’t explain well – was whether looking at charts over time has the casino effect of making it not look like money? That’s an interesting thought, Mike. It definitely makes sense and seems like a very real possibility. I’m not sure if that’d be a good or bad thing though. It could help you stay more emotionally detached, which could help you stick to your investment plan during turbulent times. Or, it could make it easier to take risks you maybe normally wouldn’t have taken, since it doesn’t seem like real money. I’m used to just staring at spreadsheets so this will be the first time I’m looking at a lot of pretty graphs instead. I’ll be interested in seeing how my feelings towards my investments change after a few months of monitoring them in this way. Thanks for this post! Previously, I was not able to link my Health Savings Administrators account with Mint. Personal Capital allows me to link all of my accounts including Health Savings Administrators. Thanks for sharing! Hey Adam, good to hear from you again! As I mentioned in the post, I was pleasantly surprised how much easier it was to link my accounts in Personal Capital than it was in Mint. Maybe Mint has improved recently but it was definitely a pain when I did it a few years ago. Let me know what you think of Personal Capital after you’ve had a chance to use it for a bit! This sounds like the tool I’ve been searching for! I never liked Mint, and ended up using Learnvest for my budgeting. When it comes to investments though, the tracking is light. Have you looked at Learnvest? Thanks for your writing about Personal Capital. I will check it out! That was exactly my reaction too! No, I hadn’t heard of Learnvest before. I’ll definitely check it out though so thanks for the recommendation. Let me know what you think of Personal Capital after you’ve had a chance to use it! I have almost signed up for this site several times. I trust the site as I have several clients using it with good luck, but didn’t want to give out my financial information again and constantly get with a sales pitch (especially knowing I would never use their services). How has this been for you so far? This type of site is getting more and more popular these days and now there are several similar sites out there for online investment guidance (including Betterment, Jemstep, Future Advisor, Wealthfront, etc.). Hey Nick, I’ve only been using it for a few weeks but I haven’t been hassled or anything. I did receive a voicemail from someone at Personal Capital thanking me for signing up, asking me if I had any questions, and offering me some sort of free portfolio checkup or something (I deleted the voicemail before I decided to write this post and I can’t remember exactly what they offered). I never returned the phone call though because I was happy figuring out how to use the software myself and wasn’t interested in whatever they offered. If they call back, I’ll make sure to take the call so that I have a better idea of what the call is all about (it’s most likely a soft sell for their advisor services). I’ll keep you posted but so far so good. I had looked at this site before, but decided to take the plunge after reading this post. One plus is that it was able to connect to one account that Mint has not been able to (my company’s 401k, believe it or not). I did find one odd rabbit hole… the “Investment Checkup” page lists “High Mutual Fund Allocation” as a risk, and “large fees” and “embedded costs” as downsides of mutual funds. It also says that there are “preferable alternatives to mutual funds” but then doesn’t say what those alternatives might be. Their financial management starts at a .95% fee. I’m curious how they think that my .05% Vanguard Index fund is at risk for “large fees” when they charge 19 times as much. This led me to their investment strategy page(the “Smart” tab of their “How To Invest” page), they believe in something called “Tactical Weighting” instead of capitalization-weighted indexes. The jist seems to be “smoothing out” any rapid changes, that is, not immediately placing more value on a “hot stock” just because the Market suddenly decided it was worth more. The interesting thing to me about this is… if they really think they have a winning strategy here, wouldn’t making a Mutual Fund out of this strategy make a whole lot of sense? For a group waxing about high administration fees, you’d think they’d want to make a large, centrally managed fund, rather than charge each individual investor for “custom allocations” of individual stocks using their metric. It seems a lot of people have heard of this site already so I’m surprised I only just found it, especially considering I’ve been looking for something like this for a while. That is pretty ridiculous they are warning against your “high-fee” mutual funds! It seems like they are shooting themselves in the foot by displaying all those scary graphs about how damaging fees are to your portfolio when their entire business model is based on charging additional fees. I had a discussion with a portfolio manager who came up with a proposal after considering my age, current allocation and needs. They have an ‘investment committee’ that looks at each account they manage to give recommendations. If you decide to let them manage your account, there’s a 100K min. As Justin mentioned, they have a tactical weighting strategy which aims to smooth out allocation sector-wise and market cap-wise compared to S&P500 which is rather weighted towards Tech and Financials. They then shared a comparison of their tactical weighting and the SP500 over the past 23 yrs (from 1990) and their approach came out 1.4% ahead (annualized rate). However, this does not account for their 1% annual fee (.95% + ETF fees that they pass on to you), so once that is taken into account, the difference becomes even smaller. The value add is the rebalancing when one sector/stock gets over/under valued and they move money from other areas to re-adjust. Hey sp, thanks a lot for sharing. I’ve actually been wanting to talk to the portfolio manager (so that I can tell people what to expect from the call) but after leaving a couple of voicemails in the weeks after I signed up, nobody from Personal Capital has tried to call me since (which is a good thing, since you don’t want anyone hassling you, but hopefully I’ll be able to take the call if they call back so that I can ask them some questions about their investment strategy). Do you get any perks for us using your sign-up link? I don’t earn anything from the Mint links but the Personal Capital ones are affiliate links. I haven’t used these types of affiliate links before but based on the terms and conditions, it seems like only some of the clicks could potentially result in any money. My balance is still at zero so it’s possible none of today’s clicks were valid leads (there are certain asset thresholds for what qualifies as a valid lead, apparently). I agree that seeing how big of an impact fees can have on your portfolio could be a shock but I think a lot of people still need to receive that shock! Fees are actually an aspect of investing that you can control so it seems crazy to me that many investors ignore fees and instead spend their time focusing on things that they can’t control (e.g. where the market is heading, which stocks will outperform, etc.). Thanks for stopping by, Brenden. Yeah, I just recently discovered Personal Capital too! I also previously used mint.com and have enjoyed the switch to PC. Nice! I can’t tell if Personal Capital is getting more popular or if I’m just noticing it more now that I’ve started using it. I still keep Mint around to categorize my spending but Personal Capital definitely blows Mint out of the water on the investment management side of things. Hey Matt, Personal Capital is definitely not as strong for home budgeting as it is for investment management. I’ve never used GnuCash, so I’m not sure how it compares to Mint, but Mint satisfies my budgeting needs so I’d check that out if you are looking for something to replace or supplement GnuCash. Glad to hear you’ve seen the light and realize you don’t have to work until you’re dead! The good news about previously being a financial train wreck is that there is a lot of room for improvement so hopefully the benefits of getting your financial house in order will snowball quickly and will motivate you to improve your financial situation even more. Good luck and keep me posted! GnuCash is pretty good for what we use it for – set up in an envelope system and doing a zero based money allocation. We had looked at Mint before, but decided on GnuCash. This was several years ago, though. I’ll check Mint out again. I’ve been doing a ton of reading here, MMM, JCollins, etc…. My mind’s been blown – and I can’t get enough. Thanks for the tips and help! My pleasure, Matt. Speak to you again soon! I have used PC for a few months. All in all a nice program, considering it’s free. I did have some issues and sent requests out via email. They were very good at responding, although some of my issues weren’t “fixable”. One in particular: As noted in the article, PC shows your allocations. Problem I had is that is done internally, within the program and there is no way to manually override. I’m not sure of all the technical side of it, but some funds don’t publish their allocations so electronic/digital sharing is possible, like when PC grabs one of your MF accounts. This seems to result in PC classifying it as “unclassified”. You can often find the allocation information yourself and could then manually classify these holding, but that’s not supported. This makes their allocation information incomplete and therefore incorrect. Another minor gripe; when viewing your holdings for a given account, you can see a performance chart for the account, and channge the chart’s time frame from days to a YTD and most anything in between. This is pretty common stuff. What you can’t view however, is the performance of the individual holdings, other than the current days performance. This does limit my analysis efforts. Back to the pluses: I’ve used Mint and SigFig, and PC seems to link to accounts the best. And although I have been contacted by my “advisor” it has been far from harassing, not even annoying really. A simple follow up email or phone call maybe once a month. Hey Dave, thanks for the comment. What did you think of SigFig? That is one of the other ones I have been planning on trying but haven’t yet. SigFig isn’t as “polished” feeling in the UI, but it does have some superior features. One thing I really like is how SF recommends similar funds to what you already own, that may have better performance, smaller fees or both. I know some more adept investment studs may find it fluff, but I get a lot out of it. So much so, that even though I tend to use PC more for regular viewing, I keep SF active just to see what they’re recommending. Also SF gives me more info on a given holding. When you’re in the Holdings view and you clik on a holding, it brings up a standard looking quote screen, with summary, details, allocation, historical performance, etc. If your doings some research on a fund/stock, it can keep you from having to jump to Morningstar, Yahoo or wherever, if not at all, at least less frequently. A bit of a cliche, but combining PC & SF would make a hell of an application. Forgot to add, one reason I don’t use SF as my “primary” is it has trouble linking to some of my accounts. I sent email requests but there was never a solution. Makes tracking your portfolio pretty hard when 1/3 of it is missing. Thanks a lot for the SigFig review. It sounds interesting so I’ll definitely check it out at some point. The similar fund feature seems like it would be particularly useful for someone wanting to do some tax-loss harvesting. I too noticed that the performance ‘bar’ above the chart shows only the day’s performance, but if you hover your mouse over the chart it draws, you can see the performance in the time period you are interested in. Hope you are recovering from the loss of appendix. I just wanted to check, now that you’ve had a few months to experiment, and see how your experience using Personal Capital is going. Are you still favorably impressed? Found any issues or concerns? Are you using PC and also continuing with Mint? Do they cover different things? I note in the comments a few issues with getting complete allocation information or limitations on the reported data. Perhaps that is to be expected with the free price. The site for SigFig looks intriguing though they apparently do charge for the use of their software ($10 per month I believe). 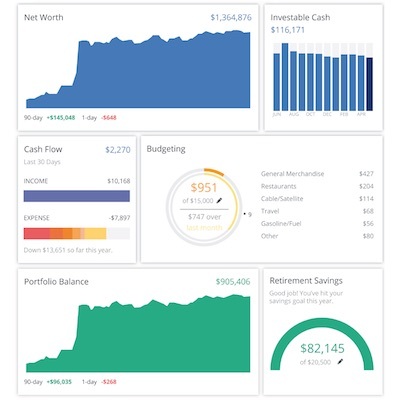 I’m interested in something to help with tracking spending and budgeting, as well as showing net worth and bringing the accounts together and helping analyze them for allocation management. Thanks for bringing these resources to our attention. Hi Jeff, I’ve pretty much fully recovered, thankfully. As far as Personal Capital is concerned, I’ve been really enjoying it! I still use Mint to categorize my expenses but for everything else, I now use Personal Capital. The interface is much nicer than Mint’s and it presents more of the data that I’m interested in seeing. I was able to link all of my accounts and haven’t had any problems importing data so as I mentioned in my post, it has been much better than Mint in that regard. I haven’t had a chance to look into SigFig yet but if it comes with a monthly fee, I don’t think I’ll worry about taking a look anytime soon. With my style of investing, there really isn’t a need to see how everything is doing all the time so I wouldn’t pay for the service but since Personal Capital is free, it is definitely nice to have! You mentioned you are interested in having something for budgeting/tracking spending and something that shows net worth and helps with allocation management so I would probably recommend signing up for both Mint and Personal Capital. As I mentioned, I use Mint to track spending and for budgetting but I use Personal Capital for my net worth and allocation/portfolio management. Since they’re both free, I think it’s worth the extra work linking your accounts twice to get the best of both worlds. Great to hear from you again and be sure to let me know what you think if you end up signing up for Mint and/or Personal Capital. Personal Capital sounds great but unless I am wrong it would still give an incomplete view of my situation as over half my worth is in my personal house and rental real estate. Do you know if Personal Capital or another such site could accommodate outside investments, perhaps automatically pulling house price data from Zillow or something? Yes. With Personal Capital you can add your home as an asset and it updates via Zillow. You can also add Blue Book Values of Autos, but their decreasing value needs to be maintained. I was on the phone with Personal Capital the other day, for their required discussion. It was a no pressure call. They did inform me that they are adding a Retirement Calculator to the product. Hopefully it will be in line with Fidelity’s. thank you for this review of Personal Capital. I’m looking forward to checking it out myself. Have any features of the service changed since you originally reviewed it? Are you still tracking your portfolio as you described? BTW, the link to the site doesn’t work for me. You may want to check it. Thank you. I am loving this website so far. Thanks for opening my eyes! QQ – While this tool looks amazing, it is not supported outside of the US of A. Any other recommendations for your European visitors? I’ve looked into Personal Capital in the past but got nervous giving up sensitive account information to yet another institution. It seems like linking all my various account information (accts #’s, PW’s, etc) into 1 destination would be Increasing my cyber-security risk. I have the same concern as Kat. I don’t like the idea of giving over all of my account information and pws to one site. I worry they they may get hacked one day. I know they have high security but still all if takes is one time. Thoughts on this? Found you through JL Collins and I’m glad I did. I enjoy both of your blogs and the wealth of information you help us with. Just a quick question regarding Personal Capital. Just wondering if you or any of your other members have come across a version that I could use in Australia to track everything. Tried Personal Capital but requires a American mobile number. Is there a possible way around this…not sure but haven’t found anything as yet. Any help would be appreciated. Keep up the good work. It’s appreciated by all whom read it I’m sure.